We're going to learn to play piano with the pedal in this next piano lesson. Everyone loves playing with the pedal because it adds a new colour and depth to their sound. Even those who are taking piano lessons for beginners can see the difference the pedal makes. I must say I encountered two kinds of students. The kind who naturally grasped the concept of the pedal, and the other kind who had two to work for a while before their pedal technique became a second nature to them. That's why I chose to wait until this moment before adding the pedal in our studies. So if you find the pedal technique complicated don't worry about it. Just follow the exercises and you'll be fine after a while. It's important to understand one important guideline! We're supposed to play piano with our hands, not with our feet! That means that the piano pedal serves us as an EFFECT but it won't replace our hands and finger work. More about that later on, but it's definitely an idea you should keep in mind. Let's talk about the functions of the piano pedals for a moment. Pianos have their pedals located under the keyboard. There are typically two or three pedals. These pedals are operated by the performer's foot. Each pedal effect the sound in a different manner. The RIGHT PEDAL is called the DAMPER PEDAL. When you hold the damper pedal down, and play a tone the sound continues to be heard even after you release the key (until you lift your foot from the pedal). When the damper pedal is depressed a mechanism of felt dampers is raised, allowing the sound of the piano strings to be sustained. This is the most frequently used pedal of the piano. Use the RIGHT FOOT is used in order to press the damper pedal. Use your ankle like a hinge. Playing the damper pedal is a bit like driving. You don't give full gas and you don't release your leg from the gas pedal when you're driving. Instead, you learn to control the amount of sustain you'd like to add to the sound and release it gently (but quickly!) when you need to, otherwise different sounds that clash with each other will blur in your ear and we wouldn't like that to happen, don't we? So, some students who don't yet control the pedal technique tend to leave the pedal roughly, making a terrible noise that disturbs the music. If Chopin would have liked to hear that sound he would have composed it in the music. So please, please, practice a quite lifting (yet brief lifting) of the piano pedal (in order to depress it again fast when needed). Before I'll give you some useful exercises that will help you to gain control at the piano pedal technique I'd like to show you the sign that shows when the damper pedal is to be used. The letters "Ped" tell you when you should depress the damper pedal and the marking that indicates the release of the pedal looks like a flowery asterisk symbol. 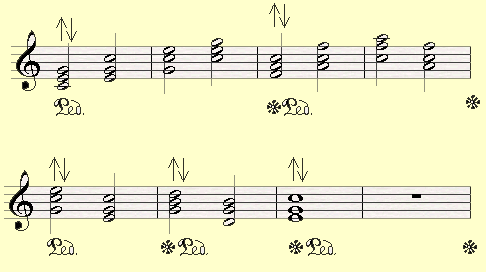 You'll see these directives often written on a musical beat, or more commonly a fraction after the beat. Why is that? Well, that brings me to our starting point where I told you that the damper pedal provides a sustain affect. We first have to hit a key and then quickly add the pedal a fraction of a moment later. When a pedal change is asked, we first press on the next note and than quickly but gently we lift our foot up and down to control the affect of the pedal. So we do most of the job with our finger and our hands and we add the piano pedal a fraction later. These handy piano pedal exercises will show you how the damper pedal causes the tones to continue sounding, EVEN AFTER YOUR HAND HAVE RELEASED THE KEYS. Press the pedal down as you play each group of notes. Hold it down through the rests. Play VERY SLOWLY and LISTEN. Having a good piano pedal technique depends very much on how well you listen. Here are the best pedal technique exercises. The first exercise will help you to learn to replace the pedal after every 4/4 bar. The arrows tells you when it's time to replace the pedal. Press on the C note on the first count, then press on the pedal a fraction later. After four counts press on D first, then lift your foot briefly from the pedal and lower it immediately to allow each note to echo alone. Start from middle C with your right hand, ascend to G, then descend back to middle C. Listen and make sure the notes don't blur and that the pedal change is quick and gentle. This next exercise demands a faster replacement of the piano pedal since you have to switch the pedal after every three quarters. Press on middle C on the first count, continue counting and add the pedal a fraction after the third count. Lift your hand quickly from the pedal a fraction after you pressed on the D.
Continue in the following manner all the way to G and back to C.
Some pieces ask for a fast replacement of the pedal after every beat. You should ascend from C to G and back while replacing the pedal after every note In this exercise. This next piano pedal exercise asks you to prform jumps between different chord inversions and use the piano pedal to create a continuity between these chords. This exercise on the other hand asks you to leave your foot on the piano pedal for two whole bars while playing a chord with a different chord inversions, and by doing so to create a great echoing effect. Last but not least, here's a piano exercise that works on playing arpeggios with both hands with the pedal. To sum up this issue here are a few pieces that will help you to improve your pedal technique. New World Symphony Download Your browser does not support the audio tag. Polovetzian Dance Pedal Download Your browser does not support the audio tag. Larger pianos have a third pedal in between the damper pedal on the right and the soft pedal on the left. The middle pedal is known as the Sostenuto pedal. Depressing this pedal will dampen only the notes that have been struck. The letters "S.P." 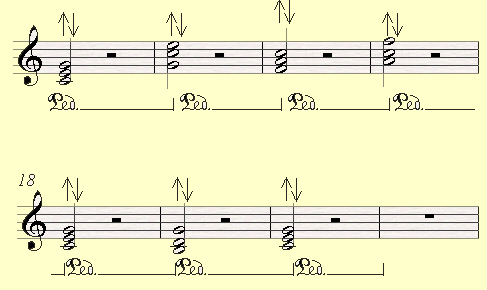 below the notes indicate when the sostenuto pedal should be press followed by a slanted up line with a downward line at the end that indicate the release of the pedal. It takes a long time before you major the middle pedal piano technique. We'll leave it for now and focus on the practicing the damper pedal. 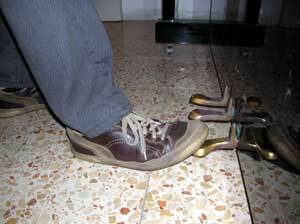 We'll end with the left pedal, called the soft pedal, muting pedal or Una corda in Italian. 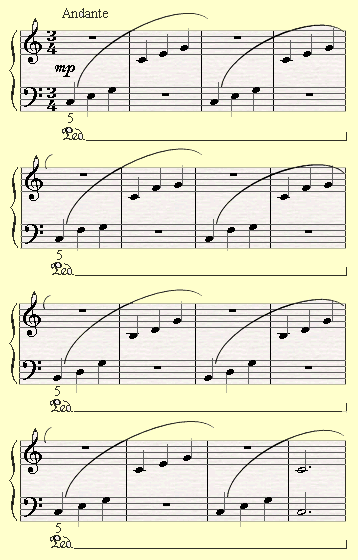 When you see the word Una-corda (Italian for "one string") in piano music, it indicates that the soft pedal is to be used. The words "Una corda" are shown under the bass staff where the soft pedal is to be depressed, and the words "tre corde" (three strings) under the bass staff where the soft pedal is to be released. and one string in the bass register. Since fewer strings are being struck a softer sound is created. When we'll get a bit further in our studies we will place our feet on the right pedal and the left pedal so that we'll be able to use both of them when needed. The idea is to depress the Una Corda pedal when we'd like to play softer. In other word, we'll use the soft pedal whenever a piano dynamic (and definitely if you have to play pp) sign is written . However, I would avoid this pedal at the moment and come back to it when we're a bit further with my piano technique. If you follow the complete piano course, I'll let you know when I think it's time to start using it systematically. If you want to learn more about reading piano notes you should definitely check out the Rocket Piano Ultimate Learning kit. Rocket Piano provides an amazingly handy and effective piano course on various issues such as reading piano notes, playing piano by chords, piano technique and more.